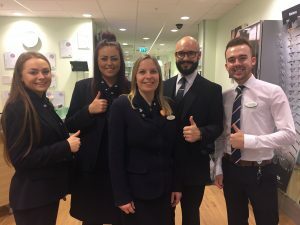 The team in our Specsavers branch have undergone specialist training to become qualified to better understand the needs of customers suffering from dementia. The staff are undergoing Dementia Friends training, an initiative run by the Alzheimer’s Society that is being undertaken by Specsavers teams across the nation. In doing so they become recognised as a Dementia Friend, with a badge to wear on their uniforms to indicate their increased level of dementia awareness to customers. Specsavers’ home- and care home-visiting teams – Specsavers Healthcall – are also completing the training. 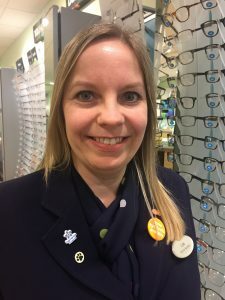 Optical assistant Lisa Webb said she was proud to get involved and explained what inspired her to find out more. She said: “For me it was personal because I have experience of dementia within my family. It can be hard to understand why someone can remember something that happened a long time ago but not today, or why they might not quite seem themselves. Robin Stuart, ophthalmic director at Specsavers Washington, also undertook the training and says: ‘It’s been a really interesting and illuminating course, giving us the ability to understand the needs of those suffering from dementia.